I am learning the hard way how expensive disorganization can be. In the meantime, we were missing the ability to take photos. We have prepaid dumb phones that do not snap high quality pics. Tablets are awkward cameras. Rin has been asking for a video camera. So we found a super cheap one and bought it for him with the stipulation that we could use it until we get our camera fixed. Sadly, this video camera takes terrible pictures. Rin doesn’t like it at all. So, we decided to return it. Okay, and where is the receipt? Who knows! Finally, after a week of searching, we located it in the Dude’s still unpacked overnight bag. So, at least one problem is solved. But we still haven’t found the warranty info on the other camera. Also, I had purchased printer paper that had a rebate and promptly lost the receipt and paperwork. A couple of days ago, the Dude went to Ace to buy Rin a pair of YakTrax (seriously one of the best products ever if you live in icy country) and forgot the $5 off coupon that has been sitting in my desk basket for a month. We are going to take the receipt and coupon in and see if they will work a deal with us. I lost so much money to Rite Aid by forgetting to keep track of the rewards dollars. We bought the boys each a pair of ice cleats, similar to Yak Trax, but cheaper and smaller, since they only go around the front of the foot, not the whole foot. We didn’t have a set place to put them, and two pairs are now missing. We bought Rin a pair of YakTrax because the other kind weren’t fitting his feet well, but I was fine with an extra pair of these kicking around. Now we are missing 2 pairs. At $10 each, this makes me sad. Never mind the things that we have to buy again because we think we don’t have any. And the socks. Oh the socks. Our household eats socks. It is very scary. I have decided to try to fix some of this. I have pinned a very large envelope to our message center by the front door. This is the coat rack that greets you at the front door. This now lives on the end of it. I will force myself to place every receipt I come across into this envelope. The Dude can move them to his envelopes as need be. But when we have to search for one, they will be in one or two places, not in various bags and baskets throughout the house. I have designated a shoe box by the front door as the place for yak trax and ice cleats. 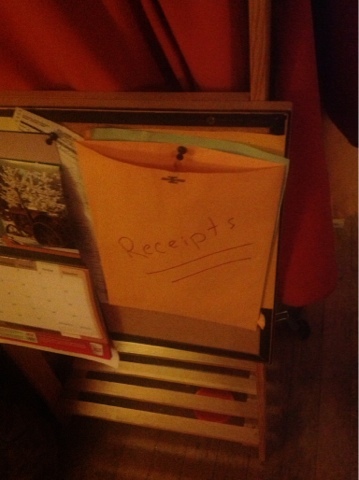 I have hung the Ace Calendar on the message center so we can find and remember the coupons. I need to come up with a system for other coupons as well. We have started tying allowance to chores. Not specific chores, but they need to be contributing to the household tidiness if they wish to receive allowance. This can be simple to elaborate. If someone has a lot of homework, they can pick up socks and put them in the hamper. If they don’t have homework, they will need to do something like clean the kitchen or bathroom. Having them each do their part will help keep the house organized without so much work and will also help them get in the habit of cleaning as they go. I need to find a way to create a list of possible chores and check when they have completed theirs each day. Maybe an app. Hopefully these will small changes will help get our lives in order and bring our bills down. And here is the little dogs’ new bed. An old box and a pillow by the fire (which is also next to the heater). They are happy. I know all about missing receipts, incomplete warranty cards, and the paid bills section of my desk that is a total loser. I will get organized as soon as I figure it out. Socks…why do you haunt me with your absence? WHY??? ?